14,732,406 steps ago was June 21st, 2013. That’s the day I wore my Fitbit activity tracker for the first time. All those steps add up to a distance of over 8,295 miles or an average of 7.5 miles per day. The three years prior to 2013 I was busy prepping a house to sell. Selling that house. Building a new house and then moving in and settling in to the new house. I gained weight, stopped exercising and by June of 2013 I was taking two blood pressure medications and weighed about 245 pounds. I knew something had to be done and putting on my Fitbit Flex was the start. It began by just walking. On most days I walked at least five miles. Once I worked my way up to walking 60-90 minutes each session I started thinking if I can walk six or seven miles surely I can run one mile. So that’s what I did, I went out on my usual walk but somewhere along the way I would start running and run for approximately one mile. I was very slow and yet I still felt like I was going to die. But I stuck with it. One mile became two miles then two miles became 5K. By December I could run 10K. Barely! But I could do it and I ran in my first 10K race in about twenty years. My finish time was around and hour and fifteen minutes but I finished and I felt like that was quite an accomplishment. Since then I’ve ran in quite a few 10K races, a few 5K races and in April of this year I ran in a half marathon. Since June of 2013 I’ve lost about 30 pounds and no longer take any blood pressure meds. My resting heart rate is well below 60 beats per minute. I still would like to lose about twenty more pounds. Not sure if I’ll ever get there but I’m working on it. My running progress is slow and steady. I’m getting faster and running further. This too is a work in progress. I’m about six weeks away from the 60th birthday and feel better then ever. Let me tell you something. If I can make this kind of progress so can you. It just takes a little discipline, dedication and a whole lot of determination. And patience! You have to be patient. Take it one day at a time. Take it slow and continue to make steady progress. I see it all the time and on occasion I’ve been guilty of it myself. Trying to push your progress too quickly will only result in burnout or worse yet injury. The key for me is to go out with a duration of activity in mind. Let speed and distance take care of themselves. Somedays are better than others. My mile splits can vary more than two minute per mile from one day to the next. I just accept it. Three years and I’m injury free. Yes, I’ve had a few aches and pains but nothing serious. Nothing that stopped me from continuing on. For me, by just going out for a specific duration has taken a lot of pressure off. If my goal is a 45 minutes and I run at least 45 minutes then it’s a successful workout. Who knows where I’ll be by this time next year but that’s part of the adventure. I know if I stay determined I will make progress. I’m not special. If I can do it–so can you. 28 out of 37 reached their daily goal and got their star. Not a bad week at all. Almost the best week ever. Still hoping for a week when everyone gets their star. I know several people had other things going on that kept them from getting to their goal. “Michael f” had a new baby born and “Neelie” was celebrating her birthday. I’m pretty confident they will both get their stars next week. The lineup for the Hump Day Goal Day changes week-to-week. I do have a method to my madness in making the initial selections. After that, it just depends on how many and how fast everyone accepts their invitation. As one group fills I move anyone who didn’t accept to a different group. I do try to keep certain groups of people together though. The group in the upper right is almost all regulars that I keep together and this group gets all stars pretty frequently. I’ve got a great group of friends on Fitbit. I try to keep them motivated and that works both ways. In fact, they are a much bigger motivator for me than I can be for any of them. I hope this post motivates you to start your own “Hump Day Goal Day” challenge next week. Not if, but when I can get all four groups full of stars I’ll post it here. Keep steppin’! Every Wednesday for about the past sixteen months I start a Hump Day Goal Day challenge with my Fitbit app. This challenge has become pretty popular with my friends on Fitbit. In today’s challenge I have 37 people participating! For those that may not be familiar with the best fitness tracker app out there (my opinion of course), you can participate in five challenges at a time with a maximum of ten participants in each. The challenges consist of “Weekend Warrior”, “Daily Showdown”, “Workweek Hustle” and “Goal Day”. My favorite is Goal Day because everyone who participates has a chance to win. Your objective in the Goal Day challenge is to reach the daily step goal you’ve set for yourself. Typically, this is 10,000 steps in a day but you can change this higher or lower. My daily step goal is 11,000 steps. The way I look at it is if I get my 11,000 steps then I’ve given 110 percent! On Goal Day, once you’ve reached your step goal a star appears beside your name. I try to get as many of the four groups of challengers to all get their star. Some weeks are better than others but I do have quite a few people who regularly get their star. My group of Fitbit friends is always changing and didn’t get up to his size overnight. Honestly, I have more than the 37 you see here. For quite a few months I could count my Fitbit friends on one hand. Once Fitbit added the challenges my group of friends started growing. I have Fitbit friends in Georgia, Florida, South Carolina, Lousiana, Indiana, Virginia, Canada, England and probably a few other places that I haven’t learned about yet. Some have come and gone and a few have come back again. Occasionally, life gets busy and I’m a little late getting out my Hump Day challenge invites out and it never fails I will get several messages during the day asking me if I’m going to have a Hump Day challenge. I’m grateful so many people look forward to this challenge. 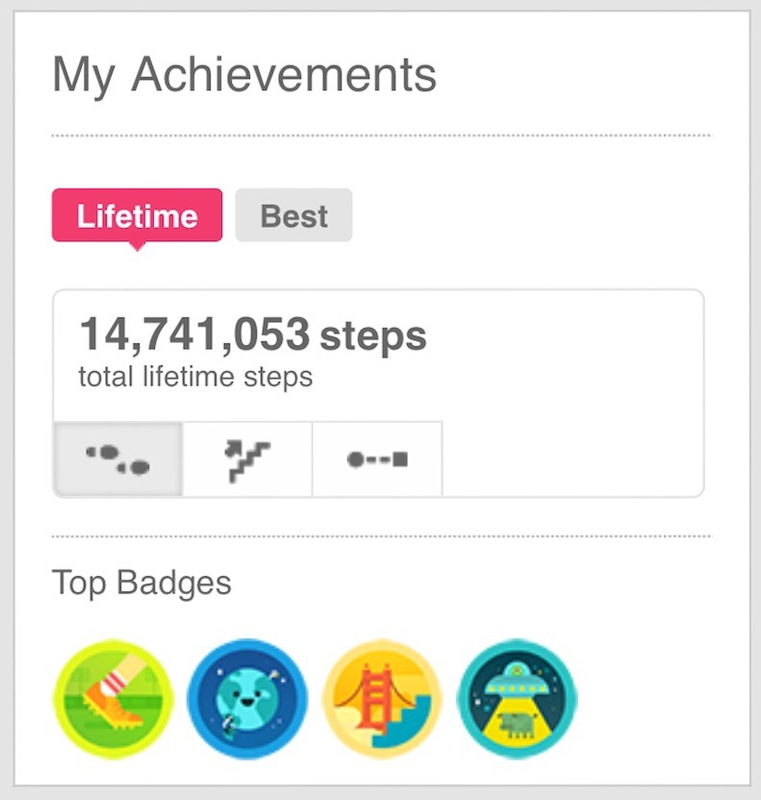 The social aspect of the Fitbit app is one of its many strong points. Everyone tries hard to make it to their step goals and when someone appears to be faltering others in the Group will send out an encouraging message to cheer them on. One thing that does disappoint me a bit is sometimes someone isn’t going to make their step goal and they quit the challenge. It’s nothing to be ashamed of when it happens. There is more to life than walking or running to reach your step goal. Everyone wants to see a star by their name but if you tried your best that’s all that matters. Don’t quit. Just be happy you tried and then come back next week even more determined to reach your goal. I’m hoping all 37 challengers make it to their goal and we see all stars when it’s finished. But it we don’t there is always next week. If you’re a Fitbit user my challenge to you is to start your own Hump Day Goal Day Challenge. It doesn’t have to have ten people participating. You and one other person is just fine. Once your challenge is finished, take a screenshot of your results and post the results on Instagram, Facebook, and Twitter. Use the hashtags: #humpday #goalday #fitbit #goals #teamwork Let’s try to make this viral. If you don’t have a Fitbit maybe you should consider getting one so you can share in the fun? At the time of this writing I see four stars. Only 33 more to go! I’ll post the results on Thursday. Happy Hump Day! 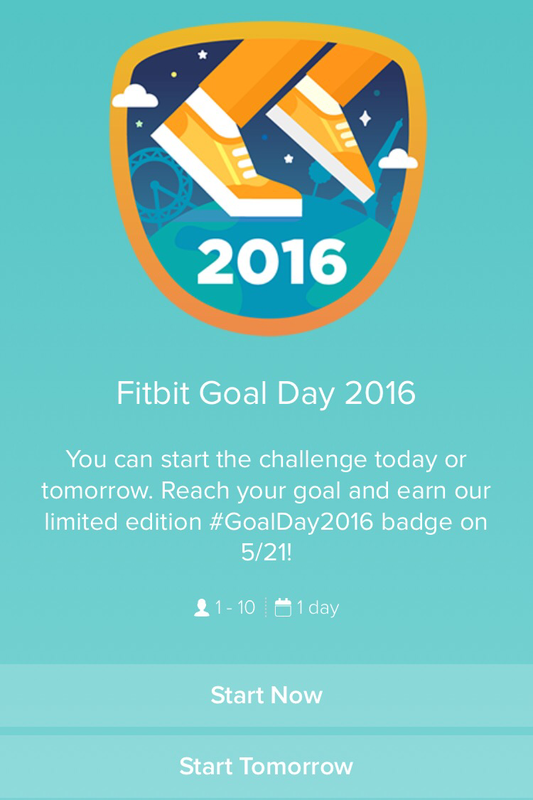 Hey all you FitBit users, tomorrow is the Worldwide FitBit Goal Day. I didn’t officially start training for the half marathon until mid-January of this year but I began preparing in mid-December 2015. At that point I had dropped twenty pounds off my weight since 2013 but for 2015 I seemed stuck at about 225 pounds. I knew I needed to drop more weight if I wanted at achieve my goals and not get injured in the process of my training. I admit, I like my beer, wine, bourbon and gin. I knew the only way to get unstuck in my weight loss was to give up the empty calories of the booze. You know what? It worked! In mid-December I gave up drinking alcohol completely. Yes, even through the holidays and the new year celebrations. 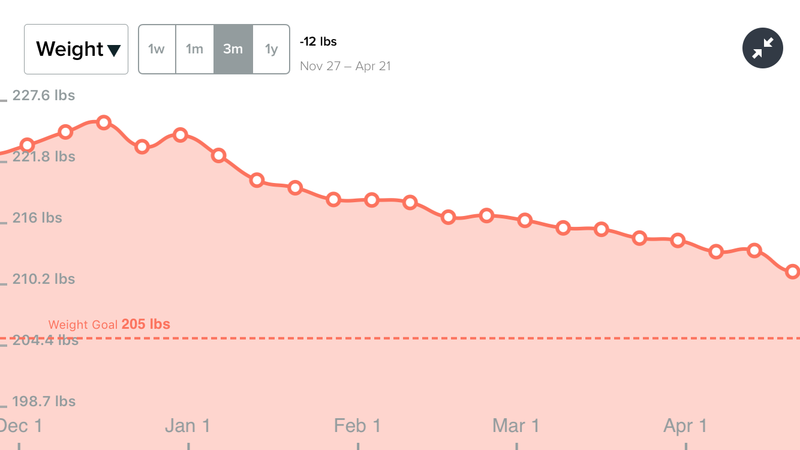 Since mid-December I’ve lost at least 12 pounds. Depending on the day–maybe more like 14 pounds. The chart below shows my progress. The goal was to get down to 210 pounds by race day. I weighed in at 210.4 last Friday. I’ve picked up a couple since but that is within my usual fluctuation so I could actually get below 210 pounds by Saturday. My overall goal is to get down to 205 or less. One thing at a time. One day at a time. The chart above is from December. My average RHR for the month was 68 BPM. Not bad for someone my age but it certainly could be better. Notice the steep decline in the latter part of the month? That’s when I stopped drinking the booze. Now compare my RHR chart for this month. I’m averaging a RHR of 55 BPM. Quite an improvement for sure. My RHR has been at this level for two months now. Why I’m I convinced the lower RHR is due to cutting back on the booze over my increased physical activity? I mentioned in my last post about my half marathon training that I had indulged in a little alcohol consumption in the past few weeks. 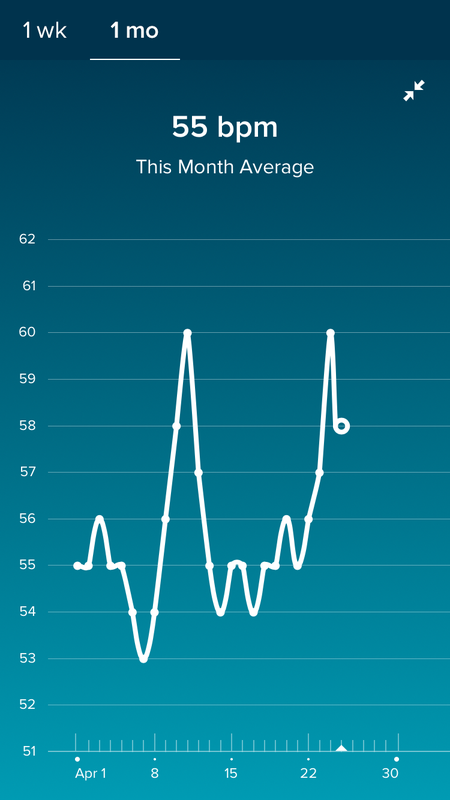 The two blips in the chart below where my RHR hit 60 BPM happened during and immediately after my acohol consumption. I can’t honestly say this is enough to convince me to never drink alcohol again but it’s enough proof I will think twice before I pop the top off a beer. If I hadn’t got to see the results with my own eyes I would never believe it. That’s changed now–I’m a believer! Sidebar: Charts were created using the Fitbit mobile app. I’ve had the new Fitbit Blaze for a week now so I thought I would tell you about my experience with the new tracker. For a little over a year I’ve used the Fitbit Surge so any comparisons I make will be made between the Blaze and Surge. Functionally, both are very similar except the Surge has built-in GPS and the Blaze uses connected GPS from your mobile phone. The Blaze comes with a classic band and retails for approximately $200. For comparison the Surge retails for approximately $250. The Blaze uses a new color display instead of monochrome. The display is attractive and I find it easier to read than the monochrome display on the Surge. The tracking device snaps into a metal frame which gives the Blaze a nicer appearance than the Surge. Unlike the Surge, you can swap out the bands that hold the tracking device. The classic band has an appearance similar to the Surge and Charge HR and is available in three colors: black, blue and plum. While a bit pricey, Fitbit now offers a leather band or metal links band for the Blaze. The leather bands come in black, camel, and mist grey. The metal band has a satin silver finish that matches the frame that holds the tracker. The metal links band retails for $130; the leather bands retail for $100 and the classic bands retail for $30. I hear Fitbit plans to offer additional bands that will appeal more to women. I hope they offer alternatives that are priced well below $100. I have the metal links band which to me, gives an appearance more appropriate for the office or evening out. I plan to use the classic band when I work out with the Blaze tracking device and wear the metal links band at work and on evenings out. My Surge will not go by the wayside either. I will continue to use my Surge with its built-in GPS while running outdoors. The Fitbit app supports the use of multiple trackers very well so switching between the two trackers is easy. You press any side button or tap on the touch screen to wake up the device. Navigation between menu screens is handled by swiping to the right then tapping on the screen to open the menu. Menu choices are Clock, Today, Exercise, FitStar, Timer, Alarms, and Settings. At any time, you can press the Back Button (single button on left side) to return to the previous screen and eventually back to the clock screen. The screen tap function is a little quirky. Sometimes I have to tap multiple time to get the watch to detect my taps. Hopefully this will improve in a future firmware update. To view text messages, calendar reminders or missed calls you swipe up from the clock menu. To view the music controls, you swipe down or hold the top right button. If you use the original watch display (three other display options are available: Pop, Zone, & Flare) you can tap on the clock to see the date, heart rate, distance, calories burned, stairs climbed, total steps. Swiping to the Today menu and tapping once allows you to scroll through the screen to view to daily activity. SmartTrack automatically detects most exercises but you can use the Exercise menu to start a workout such as running, treadmill, golf, bicycling, weights and others. The Blaze can track your running or cycling route by using the GPS capabilities of your mobile phone. Fitstar is a new integrated feature of the Blaze. The integration is limited and I would really like to see more routines included. Users like myself that use Fitstar’s premium service will not be impressed. You have the choice of three routines: “Warm It Up”, “7 Minute Workout”, and “10 Minute Abs”. I didn’t have any trouble understanding the exercises in the routines but if you’re not a Fitstar user the routines may be a little confusing at first. All three routines will give you a useful short workout, especially when you’re away from home or only have time for a short workout. The Blaze does a great job of automatically tracking your sleep. Just wear it to bed and the Blaze will do the rest and will calculate your resting heart rate for you. Unlike other smart watches on the market the Fitbit HR models Charge HR, Surge and Blaze track your heart rate all the time. Most other smart watch makers only record it every ten minutes. As with other Fitbit trackers you use the Fitbit mobile app to set your silent alarms. I use the alarms for morning wake up and to remind me to get up from my desk at work and get moving for a few. You can tap the screen to turn an alarm off or put into snooze mode for nine minutes. I tend to use the right side buttons instead of the touch screen. This is an area that I have my greatest complaint but I will admit had I not come from using the Surge I probably would not have noticed or even minded the change here. You use the lower right button to turn the alarm off and press the upper right button to put the alarm on snooze. This is the exact opposite of the Surge. The first night I used the Blaze I intended to put the morning wakeup alarm on a nine-minute snooze and without realizing it I turned the alarm off. I fell back asleep and then overslept by twenty minutes. I suppose I will get used to the change but I will always have to think about which tracker I’m wearing when an alarm goes off. I cannot think of any compelling reason why Fitbit didn’t keep this function consistent between both trackers. If you are a Fitbit Surge user, there is little reason to switch. Personally, I got the Blaze for its appearance and not for its functionality. A Fitbit Flex, Charge or Charge HR user who doesn’t need built-in GPS the Blaze would be a good upgrade option that has a cheaper starting price point than the Surge. Of course, if you start adding custom wristbands the saving will disappear quickly. The Blaze has very good battery life. Even with my frequent tapping, swiping and button presses while going over all the features and functions I got four days on a single charge. Overall, I like the Fitbit Blaze and will wear it daily however, I will continue to use my Surge on my outdoor runs so I can take advantage of the built-in GPS. If you are wanting to upgrade from a first generation tracker, the Blaze is a great option. All measurements from the tracker are accurate and battery life is very good. If you want or need built-in GPS you may want to consider the Fitbit Surge, otherwise you can’t go wrong with the Blaze. Now that I feel like I can call myself a runner again I’m ready to go out and run in an organized event. I search the internet for races in my area and I find a 10K scheduled in about eight weeks. At the time I certainly didn’t feel prepared for a 10K and would have rather signed up for a 5K but there wasn’t anything available that fit my schedule. I decide to go ahead and sign-up for the 10K. With eight weeks to get ready I added the 10K Runner app to my iPhone to use as my training plan. The 10K Runner app is a fourteen week program with the first eight weeks exactly like the 5K Runner app. If I started with week nine I could complete the training program in time for the 10K race. Now, I managed to complete the program in time for the race but in hindsight I should not have. I really should have started the 10K program from the very beginning. Before the training was complete I started having some pain in my left knee. I could still run, in fact it felt better when I did. My knee hurt the rest of the day. I did go to a sports doctor to have it checked out and he didn’t find anything obviously wrong with my knee. He gave me a prescription for some anti-inflammatory meds and told me to go out and do as much as I felt comfortable to do. The meds helped but I didn’t want to take them for very long. After each run I would ice down my knee to help with any swelling. I couldn’t see any swelling but I didn’t want to take any chances either. It took me several more months to figure out what was going on with my knee. The problem wasn’t from overuse but from poor running mechanics. I’m convinced had I started the 10K Runner training program from week one instead of week nine I would have detected the running mechanics problem much sooner. Also, starting at week one would have given my muscles and joints a chance to regroup after finishing the 5K training program. This alone may have prevented my knee pain altogether. I’ll write more about running mechanics on a later date.